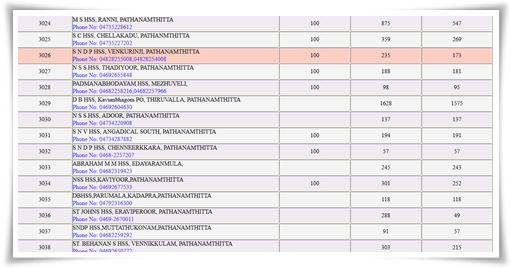 Kerala plus one application 2014 verification status in schools is currently available at HSCAP website. As students are eagerly waiting to know the application status and allotment status of Kerala Plus One admission 2014, the results would be published in the third week of June. Applicants can check the allotment status by visiting www.hscap.kerala.gov.in, the official admission website. With few more days left for the trial allotment, the education department has published the application verification status in schools at the HSCAP web portal. One can search through various schools and know the number of applicants who had submitted applications. There had been a record total of applications submitted at some of the popular schools in Thiruvanthapuram, Ernakulam and Thrissur. The number of applicants in DB HSS Thiruvalla is counted to 1575 while some of the schools have received more than 500. As the last date for application submission for Single Window System has extended upto 16th June, there is possibility of more students to apply for the plus one admission. According to a recent calculation more than 5 lakhs students have applied online for this year's allotment. After the final preparations, the trial allotment is expected to get published by 18th or 19th of June followed by first allotment. Applicants can check their allotment status soon after it published at the HSCAP website. With a record students along with more than 50,000 applications representing CBSE, SAY exam winners and SSLC passed students from other states make the strength of applicants cross 5 lakhs. As the number of seats in higher secondary made available to accommodate only 4.42 lakh students, the government plans to raise the number of seats in various schools. As there was a confusion regarding the online process, the state education department has opened counters to supply forms to students from 9th June. The trial allotment would be made on the basis of the options registered and the rank of the candidate. Even though, the test allotment does not guarantee admission for the plus one course, students can get a free idea about their status. To view the trial allotment, students should navigate to candidate login section and login by entering your application number and password there. After the publication of the first allotment, students who are listed in the allotment must have to remit the fee as per the process. The date of admission in the concerned school will be declared through a notification. To get updates about the allotment and other admission announcements, students must keep in touch with the HSCP website. http://www.hscap.kerala.gov.in.